Forget the Oscars – where's the politics? The Oscars this year celebrated nostalgia and the overall quality was poor. 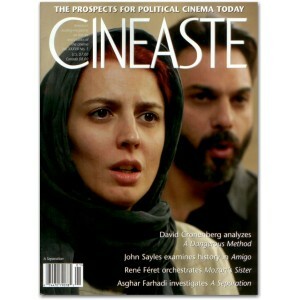 Far more interesting was the attempt in a recent issue of Cineaste to raise discussion of ‘The Prospects for Political Cinema Today’. You’ll note that the cover of Vol XXXVII No 1 (December 2011) features A Separation, probably the best film on the Oscars list, coming from a country where making a film still seems like a political act. Nick’s recent postings remind us how rare it is to find films with political aspirations. Cineaste‘s symposium rounds up the thoughts of 14 filmmakers with a variety of perspectives on what makes a political film. In his introduction to these responses British film studies academic John Hill, one of the UK’s leading writers on social realist cinema, offers some reasons why now is a good time to revisit the concept of political cinema. He suggests that recent political action in response to economic crises in the West and political crises in the Arab world in particular have seen the growing importance of the impact of ‘social media technologies’ and new types of political action which were inconceivable before the era of digital media. He then wonders what an ‘old medium’ like the cinema still has to offer. 1. What do you understand by the idea of a political – or ‘politically oppositional’ – cinema in the current economic and political climate? 2. What specific role does political cinema have in an era of social media and instant communication? 3. What aesthetic models of political cinema do you believe are most relevant today? Which styles work best to engage an audience? What’s the difference between documentary and fiction in terms of political effectivity? 4. What are the main political and economic obstacles to making political films or getting them adequately distributed? There are some good points here (and plenty more in the other contributions) so I’d like to invite our contributors to pursue some of them and discuss the four questions, perhaps selecting specific films as case studies? Contributions and comments please! This entry was posted in Film culture, Film theory, Politics on film. Bookmark the permalink. This looks excellent but be warned that, although the magazine is only $7, it costs another $15 for shipping. They were still selling that edition at Cornerhouse in Manchester today. You could ring up the bookshop there and reserve a copy and I’ll pick it up for you. (It’s £4.50 at Cornerhouse) They used to sell it at Borders in Leeds before it closed down. Great; thank you. It’s under your name!